An exciting new construction from Potton, the Self Build Live Passivhaus project, has invited JB Kind to be one of its key partners. Self Build Live allows all aspiring self-builders and existing Potton customers to visit a live Passivhaus build and see its progress first hand at a series of events throughout the year. Potton, which have been specialists in supporting self-builders to realise their dreams since 1964, have been traditionally known for innovative designs and attention to detail, much like JB Kind, and we’re pretty sure that it’s the perfect fit between our two companies of our similar experience and ethos, that is one of the reasons that Potton chose to team up with JB Kind for this prestigious project. A Passivhaus home is a very specific type of new build, with stringent design and construction guidelines from the Passivhaus Institute in Germany, the finished build ensures the home is not only luxurious, but also has extremely high environmental credentials. The Passivhaus is the first UK Passivhaus show home and it joins four other self build designs at the Potton show centre in St Neots, Cambridgeshire. Self Build Live was launched in line with the build in April 2015. 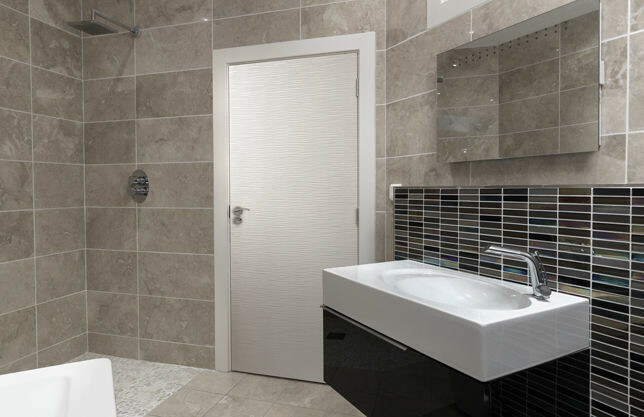 JB Kind has supplied 11 doors – six of our wonderful Walnut Mistral downstairs, including a glazed option, and five of our, new-for-2016, Moulded White textured Ripple doors, and we’ve also supplied seven added extras in the form of our popular Handle Packs to complement the door designs. And JB Kind’s involvement hasn’t stopped there, we are also really pleased to have been asked to share our 30 plus years of door expertise at the Self Build Live ‘Final Finishes’ event in July. This free event is open to all interested parties whether they are aspiring self-builders, enthusiastic builders on the lookout for land or construction professionals. Everyone will have an opportunity to have a guided tour around the (by that time) almost finished Potton Passivhaus and then hear from several key industry speakers, including JB Kind Sales Director Simon Johnson. “We are very pleased to have been asked to, not only provide the doors for this prestigious Passivhaus home, but also to present at one of the complementary and informative events that run alongside this innovative build. “I will be offering up some excellent top tips from my industry experience about both the practicalities of door purchase, choice and fitting within your self-build but I’ll also be sharing some door style snippets too. “I’d encourage anyone who is interested in building their own home to sign up to one of these free events to find out more about the process, see a build in action and to meet the professional Potton team in person, so you can tap into their expertise and ask them any questions that you might have about the process. “Potton are thrilled to be opening a contemporary Passivhaus show home alongside the other more traditional designs at our show centre at St Neots. JB Kind were the obvious choice as Potton have been working with them for many years. Having walnut doors will be a novel addition to the Passivhaus interior as it’s important to show customers options and give visitors various style choices. Self Building encourages innovation and uniqueness so the more variation we can offer through our show homes the better.